That’s what’s been driving Ron Hill Auto & Transmissions for the past 40+ years. Today it’s more important to us than ever. Our outstanding reputation and lifelong customers can attest to our standing as the industry leader. Our team are all keen motoring enthusiasts and continue to better their knowledge and skills for the latest advancements in automotive technology. We are honoured to be the winners of the “Excellence in Business” Award. Ron Hill Automatics are winners of the prestigious “Excellence in Business” Award for 2012 as Enterprise of the Year and have been acknowledged for our commitment and passion to excellent customer service on the Sunshine Coast. The finalists undergo a three-tier judging process consisting of written submission, on-site business interview, and mystery shop. Each section is judged by two judges and all six scores are added together to determine the large and small business winner of each category. All scores are included in the totals to maintain impartiality. The highest scoring large and small business across all categories is awarded Enterprise of the Year and Small Business of the Year. We would like to thank our Sunshine Coast customers of the past 40 plus years for your encouragement and support. Here’s to the next 40! 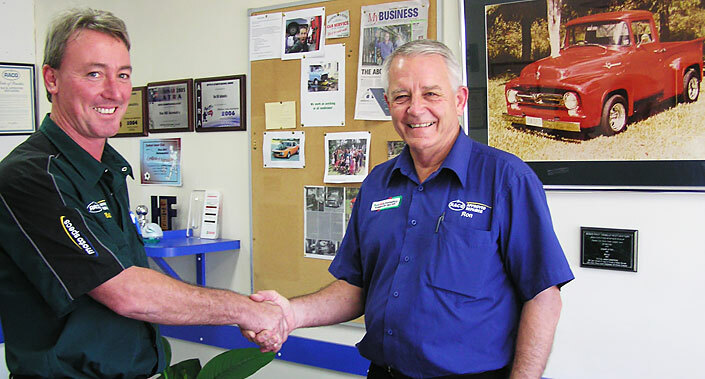 Ron Hill started repairing automatic transmissions in a small shed at the Gap in Brisbane in 1975. It was an idea of his father in law, Gordon Wallace, for Ron to study up on automatics as they were getting more commonly used in vehicles. Ron commenced his Motor Mechanic’s Apprenticeship in the Australian Army and studied transmission maintenance and repair with the International Correspondence School. After 5 years of running the business at the Gap in Brisbane, it was moved to 44 Kayleigh Drive, Maroochydore in 1980. Ron has a real passion for the industry and it even flows through to his hobby of restoring and building trophy winning muscle cars. These have included a highly modified 1956 F-100 and a 1955 Chev Tudor Belair Sedan. Ron took Bill Olah on as a partner/owner after many years of working together in the business. This was a great move as Bill brought on board a boost of new enthusiasm and excellent organisational skills. Bill’s automotive training was achieved at Sydney as a motor mechanic and specialised in automatic transmissions. Bill is a keen 4WD enthusiast with frequent trips to Fraser Island, Cape York, and Double Island Point. Fraser Island is a favourite adventure with the family catching plenty of spotty mackerel. As an experienced off-road driver, he understands the importance of upgrading drivetrain components for recreational usage and is a strong advocator for proper transmission maintenance. Ron and Bill both share strong family values and strive to maintain a friendly, professional team so everyone enjoys their day at work. We really value our customers entrusting us with their vehicle’s maintenance, service, and repairs – we do our level best to exceed their expectations. We pride ourselves on our integrity and our team will convey that in how we serve you, our customer. Our business has been steadily growing on the Sunshine Coast and we are proud to be a leader of the industry. Our experienced team are long serving, dedicated professionals who are committed to excellent service. Most importantly, we are always happy to help. If you experience transmission issues, would like to maximise your vehicle’s performance or book any general mechanical and electrical services, give us a call today!